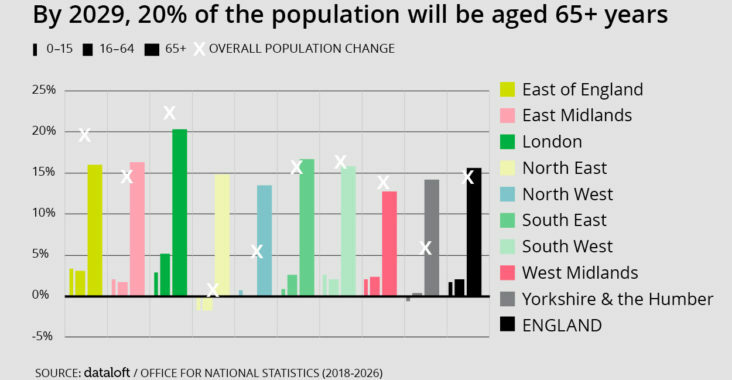 The population of England is set to increase by just over 2.5 million over the next eight years according to new projections released by the Office for National Statistics. All but 15 of England’s 359 Local Authorities will see their populations rise. While this represents growth of 4.5%, the population who will be aged 65 or over is set to rise by 15.4%. By 2026, one in five of the population will be aged 65 or over, an additional 1.6 million people compared to now. The importance of those aged 65+ on the housing market is significant. Research indicates that the over 65s hold £100 billion worth of housing equity, with over 50% of the age group living in under occupied homes. By 2026, 30% of England’s local authorities are projected to have a population where one quarter of residents will be aged 65+. Across West Dorset, East Dorset, Rother, North Norfolk and West Somerset this proportion rises to over a third. Stephen Frost,thanks so much for the post.Really thank you! Great.